Bitcoin finally had the big break above the $4,000 resistance line this week. What is next for the coin? 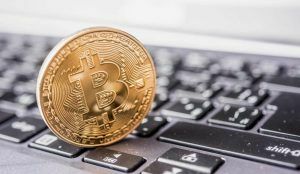 As the price of Bitcoin continued to consolidate around the $3,850 mark for a few days, the crypto investors could not help but wonder whether the price would finally punch through the resistance line. The moment we have all been waiting for several weeks is here now, as Bitcoin went in a bullish direction and broke out of the triangle. After completing the above, a major move was anticipated in the following days. Both directions were considerable, as nothing is ever sure in trading. The minor descending trend line changes tested the lower support levels again, but the coin had a good week this time around. With the dominance of 50.8 percent in the cryptocurrency market, Bitcoin reached a total cap of over $70 billion this week. Last week’s entry into the bullish zone immensely helped Bitcoin to initiate a new bull market this week. 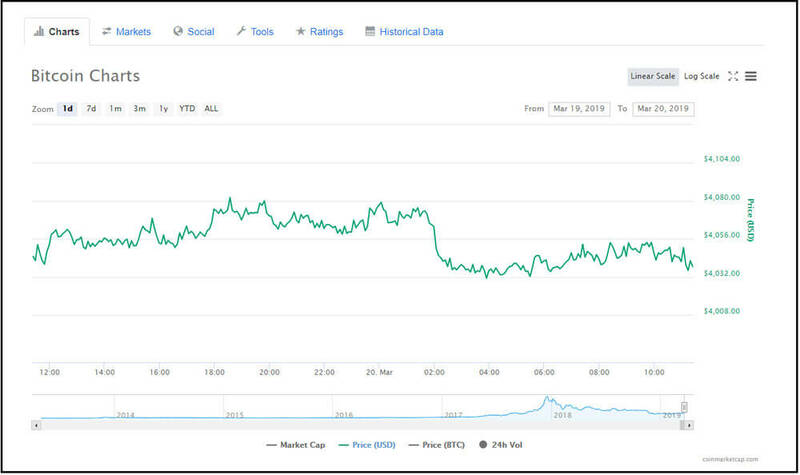 The fresh upward move, however, does not mean Bitcoin had a very stable week. More significant highs and lows were identified, as the coin fought for keeping greater resistance and support levels. Although there was a temporary bearish line, no major downward patterns were spotted in the Bitcoin Weekly Chart. 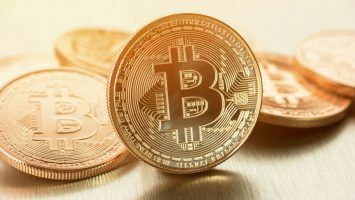 This time the bulls guarded a much higher resistance, allowing the price of Bitcoin to fluctuate continually above the $3,800 mark. Three days prior to the breakout, on March 13, Bitcoin was still inside the $3,800 support area, ultimately making the lowest point of this week. The bulls, however, fought hard and managed to get the coin above the $4,000 line. This week’s highest point was reached on Saturday, March 16, at $4,073. Bitcoin has not reached this price in a while. Since last week, we were breathlessly waiting to see whether the coin would take a more favorable direction. Now that Bitcoin progressed in a positive route, the real question is whether the price will remain stable. This week’s highest high was reached on Saturday, which once again, proved how good the weekends are for the traders. After reaching the highest mark, Bitcoin took a subtle descending twist. 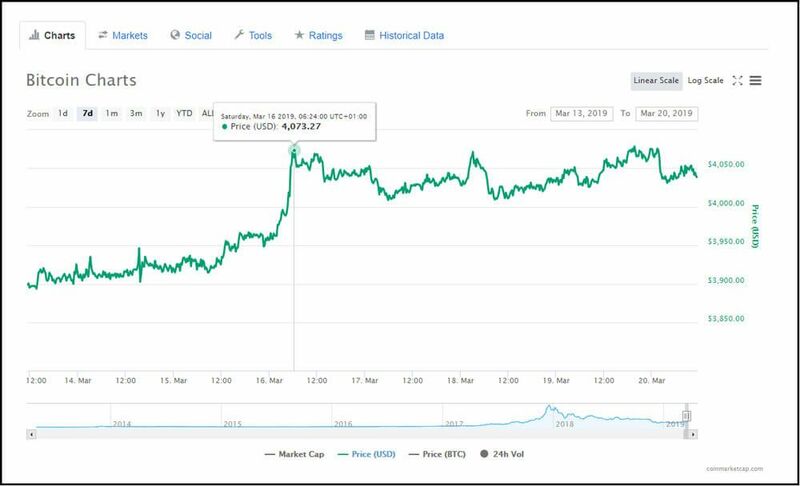 Just one day later, on Sunday, March 17, Bitcoin could be found at a price of $4,008. 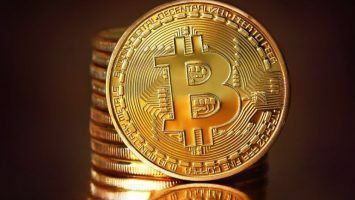 Then on Monday, the bulls again took the price near to its prior record, when Bitcoin raised to $4,071 against the U.S. Dollar. For the next following days, Bitcoin’s price could be spotted altering, making regular lows and highs. As of now, Bitcoin has a price of $4,045 and we hope the bulls will continue to trade above the $4,000 line. Bitcoin’s daily chart, as a more detailed representation, shows that the level 60 of the relative strength index is being tested as a support level. The Stochastic RSI oscillator crossed over indicating downward, going around the overbought area. The 50 days moving average (MA) was spotted to cross over the 100 days moving average. This cut-across contributed to Bitcoin’s breakout. Bitcoin did not have a significant daily trading volume this week. It was displayed around the monthly average. However, the coin may take an ascending turn since more green candles than red ones are identified. This is considered a potentially bullish sign for the weeks to come. While we can still clearly conclude this week was a bullish week, a bearish triangle can be spotted on Bitcoin price’s four-hour chart. Due to the reason this triangle exists, such descending trend-line can cause re-testing of lower resistance levels. The good news is the MACD is slowly but surely moving into the bullish zone and the hourly RSI is moving towards the level 50 after resting the 40 level. At this point, the major support levels vary from $3,940 to $3,900. The major resistance levels can be found at $3,980, $4,000 and $4,040. Although we never know what might happen until next week, these technical indicators direct that the upcoming Bitcoin trend lines may be in favor of the bulls.